The characteristic alliterative poem of the 14th and 15th centuries tells a story of incident and adventure: it is pre-eminently the poetry of narrative. Yet it is also, more than any other kind of medieval verse, remarkable for passages of vivid description, taking advantage of the extraordinary rich verbal resources of the alliterative poets and the characteristic strengths of the alliterative line. Memorable examples are the green chapel in Sir Gawain and the Green Knight, the storm at sea in Patience, the dream-landscape in Pearl, and the mysterious tomb in St Erkenwald; there are violent battle-scenes, descriptions of hunting and hawking, beautiful meadows and terrifying mountains, purling streams and wild rivers. Here is a seeming contradiction, or at least a tension that needs to be explored. The descriptive passages are digressions that interrupt the narrative; the story must pause to take in a visual effect. In Description and Narrative in Middle English Alliterative Poetry, Thorlac Turville-Petre explores this relationship between description and narrative, and the contribution of description to the narrative. 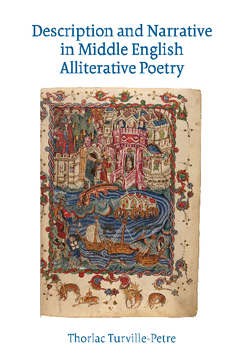 Passages from all the major alliterative poems are analysed, and translated as necessary, so that the book may meet the needs of students as well as scholars familiar with the language and the topics discussed. Thorlac Turville-Petre is Professor Emeritus at the University of Nottingham. His authored works include 'Alliterative Poetry in the Later Middle Ages: An Anthology' (Routledge, 1989), 'England the Nation: Language, Literature, and National Identity, 1290–1340' (Oxford University Press, 1996), and 'Reading Middle English Literature' (Blackwell, 2007). Ralph Hanna, Professor of Palaeography (Emeritus) and Emeritus Fellow at Keble College, Oxford.